By far, Wallwisher is one of the most popular Web 2.0 Tools that I have shared with students, teachers, Principals and Directors in our school system! Wallwisher makes it easy to post a question on a customizable, decorative "wall" on the internet and get immediate feedback in a fun, creative and unconventional way. This link shows the responses from ECPS about ways to use Wallwisher in education. Feel free to add your ideas too! Click on the link and then double click on the wall to give your input. http://www.wallwisher.com/wall/7HNqnL48Oh. I created this SlideShare Presentation as a step-by-step tutorial for those who missed one of my Web 2.0 Workshops and would like to learn how to use Wallwisher. Make sure to turn on your computer's sound if you would like to hear the directions. Thomas Barrett shared this Google Presentation emphasizing some ways to use Wallwisher in the Interesting Ways section of his Blog. Notice that others contributed to this presentation! Web 2.0 is about learning, sharing and collaborating. Thank you Thomas. How did a low-wealth, rural school district in Eastern North Carolina transform their high schools from "old school" ways to new 21st Century Schools? 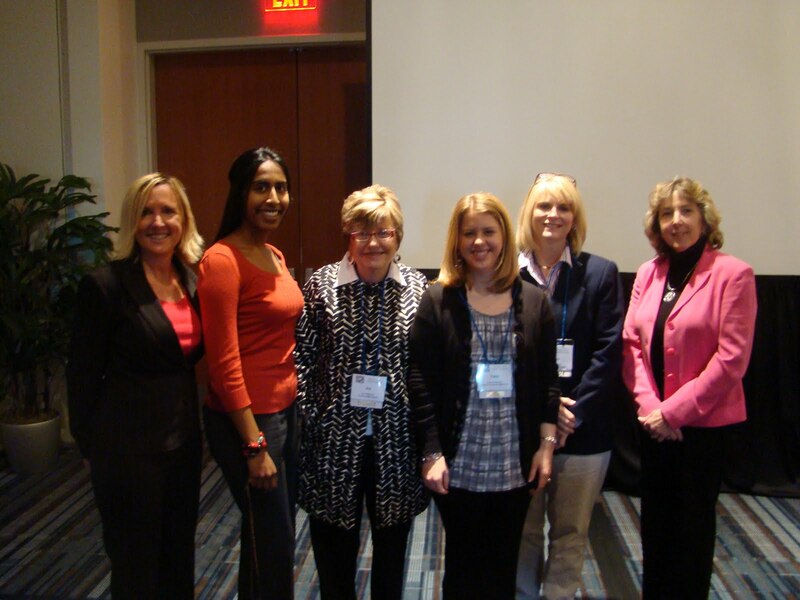 A team from Edgecombe County Public Schools answered that question at the North Carolina Association of School Administrators (NCASA) Conference. Their topic was the high school 1:1 Laptop Program. A compelling presentation inspired school leaders from across the state to consider laptops as a way to increase student motivation and engagement, improve learning, and prepare students for our 21st century world. A video was shown with teachers and students discussing the value of having the laptops. The video can be seen on Teacher Tube and YouTube. a web-based mind mapping software allowing teachers and students to create visual maps of brainstorming and save those brainstorms online. Their awesome presentation included examples of projects done at their schools such as: Twitter in the classroom, Voicethread, WebQuests, and Wikis. Next, Joy Robinson shared her classroom website which completely eliminates the need for paper in her classroom. She uses an InterWrite Pad to annotate over documents, saves them and then sends them to students. The highlight of the day came when she shared a music video that several of her Advanced Algebra students created using MovieMaker to their own rap lyrics. Finally, Jenifer Marquis, discussed her role as a K-12 Instructional Technology Specialist. She is working to build a 21st Century School District. One way she accomplishes that is by building a Personal Learning Network through ISTE Membership, NCTIES membership, Twitter, Blogging, Social Bookmarking and Google Reader. She stated, "Even though we live in a rural area, I am connected to experts from all across the nation with the use of Web 2.0 networking tools". In turn, she shares with others across the school district through her Blog, Wiki, Email, and Twitter account. She also supports K-12 leadership and teachers by hosting Web 2.0 Workshops, presenting at leadership meetings, and meeting with the Technology Facilitators once a month. Soon she will be offering professional development online through the new Edgecombe Moodle site. The presentation ended with many questions from interested administrators. One thing was clear at the end of the day, Edgecombe County Public Schools' 1:1 Laptop Program is truly making a difference. I finally get it! At first, I thought twitter was ridiculous; a technology so people could tell others what they had for breakfast or some other triviality. But recently I discovered the amazing power of networking and personal learning with twitter. Ironically, I was in a twitter session by Kathy Schrock at the North Carolina Technology in Education Conference (#NCTIES) when the power of twitter was revealed to me in an unexpected way. With laptop open and signed in to my scarcely used twitter account, I began receiving a flood of tweets from all across the conference. I was getting the best information from rooms across the Raleigh Convention Center in short tweets, usually with links to some great new ed tech resources. I was amazed and could barely keep up with the barrage of info that was pouring right into my very lap. I finally recognized twitter's remarkable ability to build a Personal Learning Network (PLN). The folks at NCTIES and I are still sharing instructional technology websites, links, blogs, and information that will be useful to me in my work and hopefully to them! Always give as much as you take I was told. When the conference was over, one of my new contacts, or one of their contacts, or one of their contacts (ad infinitum), attended a technology conference in another state and it started all over again(#macul10). My PLN is growing exponentially and I am receiving tweets from that conference too. I can't wait to "follow" the next person to another conference! So it doesn't matter where you live or work. Let the power of twitter keep you connected and begin creating your Personal Learning Network today. You can start by following me at http://twitter.com/jenifermarquis. 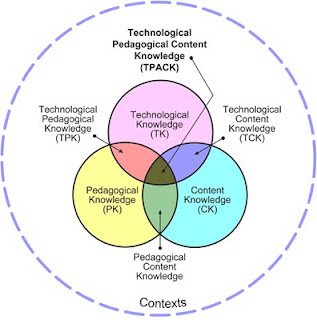 This TPACK diagram shows the relationship between technology, pedagogy, and content knowledge. Teachers must pinpoint what students are to learn (content), how to teach it most effectively (pedagogy) and purposefully select tools that will leverage student learning (technology). Teachers who learn how to incorporate all three areas of TPACK, will be amazed by their students' enthusiasm, high levels of achievement and on-task engagement.